e-Travel Tracker is essential for corporation’s compliance with duty-of-care responsibilities and liability protection. 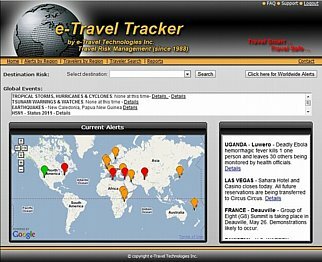 The e-Travel Tracker Dashboard provides travel, security and other management with a single snapshot of alerts, travelers and employees at risk around the world. Includes contact information for travelers affected by a specific Alert. Go to our Demo Page. You may now give each of your corporate clients the ability to track and contact their own traveling employees. You must first assign a Corporate id number for each corporate client. We then set up a single Corporate User login/Password with that id number. Their login will allow them to sign in directly to e-Tracker and identify only their travelers. The Traveler Advisory must contain the corresponding Corporate id number when the Advisory is created. Contact Customer Support for pricing and set up. As above, you must first assign a Corporate id number for each corporate client. We then set up unique login ids for your corporate client which allows them to track their own traveling employees, plus have access to all Advisory databases, print (only) Advisories, and subscribe to Daily Alerts email. Contact Customer Support for pricing and set up. Note: Corporate travel managers should contact their TMC for pricing. TMC’s must be a Premium Level Subscriber in order to provide the above services. TMC’s should check with Customer Support for current pricing before presenting or quoting this service to your client.